Shocks and struts, on the other hand, are dampeners that keep body movement within the necessary range and press the tires to the road to keep adequate traction. In simple terms, springs hold up the body of your automobile. There are several designs of springs: coil, leaf, torsion bar, etc. Their vital job is the heavy lifting. Shocks and struts have a chamber filled with hydraulic fluid. Bumps activate a piston that pushes the fluid through a series of valves to dampen the bounce. Then a rebound spring pushes the piston back in place. Stage 1 is for the millions of small bumps St Catharines auto owners encounter in everyday driving around the St Catharines area. The 1st stage valve is a notched disc through which fluid flows at a controlled rate. Stage 2 is for mid-sized impacts: things like dips, driveways, expansion joints, as well as forces encountered in turns and when stopping and accelerating. These bumps and forces are not severe, but they come in various shapes and sizes. 2nd stage dampening is handled by a set of flexible discs that fit inside the shock/strut chamber. When St Catharines auto owners hit this type of bump, the fluid is compressed against these discs and they flex to allow fluid passed. The bigger the bump, the more they need to flex. Stage 3 is for major impacts like curbs, potholes, etc. 3rd stage dampening is accomplished by restrictive ports in the stage 3 valve. This is the last stage in maintaining proper tire and body control. It is the Stage 2 flex discs that wear over time. The metal becomes fatigued and flexes too easily, allowing fluid passed to the Stage 3 valve. This is why one of the characteristics of worn shocks is a harsh ride: you're getting to the restrictive 3rd stage too soon. 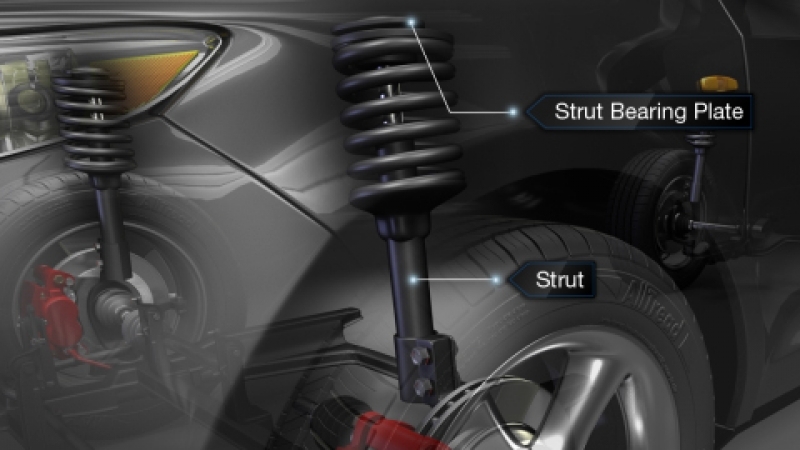 Severely worn shocks/struts cause your tires to have reduced contact with the road. When taking a curve at a higher rate of speed or in an evasive maneuver, the body leans to the outside of the curve - literally trying to pull your vehicle off the road. A hard stop throws the body forward, significantly increasing your stopping distance. Acceleration causes the rear end to squat, and thereby reduces traction on the front tires. Loss of tire and body control can greatly curtail the effectiveness of your car's critical crash avoidance systems like traction control, stability control, and anti-lock brakes. Your shock and struts wear slowly so it's hard to consciously observe a change in their performance. How soon St Catharines drivers shocks and struts wear is impacted by the loads they carry and the condition of the ON roads on which they drive. A good rule of thumb for St Catharines motorists is to have them evaluated with a road test at 50,000 miles or 80,000 kilometers – by that time your shocks/struts will have moved up and down 75 million times. The adept service professionals at Sharp's Auto Center in St Catharines can survey and test your suspension system and help you select the right parts to restore or improve your car's designed performance. At Sharp's Auto Center, we install quality NAPA replacement parts.